There is a new panorama tour (virtual tour) from Antarctica, namely from Cape Adare in the Ross Sea. Cape Adare is one of the most famous, but rarely visited places in Antarctica: in 1895, it was the site of the first well-documented landing on the continent, and in 1899 it was the site of the very first wintering on the continent, by an expedition led by Karsten Borchgrevink. These stories are shortly summarized in the new panorama tour, and so is the visit of the northern party under Campbell during Robert F. Scott’s final expedition with Terra Nova. The panorama tour documents the historic huts at Cape Adare and gives impressions of the amazing scenery of the place at the northernmost end of Victoria Land, being part of the famous Transantarctic Mountains. Cape Adare is also home to the largest colony of Adélie penguins in Antarctica, which means in the world. In early February, I was lucky to spend a rare good weather day at Cape Adare. On this occasion, I shot the panoramas which are now assembled to this new panorama / virtual tour (click here to get to the tour). Enjoy a virtual trip to Cape Adare! 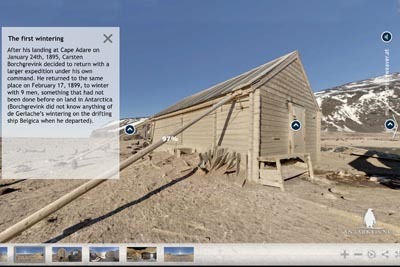 Virtual tour of Cape Adare, site of the first landing and wintering in Antarctica and home to the largest colony of Adélie penguins.